Philo on Buried Treasure (Unchangeableness, 91-92) at (Rutgers University Dept of Religion) Mahlon H. Smith's Into His Own: Perspective on the World of Jesus companion to the historical study of Christian texts. "Anyone With Ears," The Jesus Database, an online annotated inventory of the traditions concerning the life and teachings of Jesus. Dr. Gregory C. Jenks, FaithFutures Foundation. XVII.8, 11, 15-17, 19-36; Tatian's Diatessaron (c. 150-160). Latin text of Augustine's Sermon 74 (Mt. 13:52). "The Scribes then were they who professed the knowledge of the Law, and to them belonged both the keeping and the studying, as well as also the transcribing and the expounding, of the books of the Law." Matthew XXV, Proslogium, Anselm of Canterbury, 1077-1078. "There are many in the Church who nevertheless are not of the Church, and therefore at length will be cast out: but the full and perfect cleansing of them is deferred to the last day." "Though nothing can be given as a price for this salvation, yet much must be given up for the sake of it." "The one pearl of great price, instead of being found by accident, as in the former case, is found by one whose business it is to seek for such, and who finds it just in the way of searching for such treasures." "Valuables which, with us, are entrusted to banks, are in the East buried in fields and gardens to save them from robbers and accidents." "A Hidden Treasure," Commented Bible Passages from Taize, 2011. Commentary, Matthew 13:31-33, 44-52, Warren Carter, Preaching This Week, WorkingPreacher.org, 2014. "...new emphases emerge, particularly the interplay of searching, finding, celebrating, and selling all in order to possess something of great value." "Parables That Do Things," David Lose, ...in the meantime, 2014. "Why, then, compare the kingdom of God to a pernicious weed and pollutant?" "Inviting a Kingdom Imagination," Karoline Lewis, Dear Working Preacher, 2014. "The promise of the parables about the kingdom of heaven is that even when the kingdom is not seen, it is near." "Five and a Half Parables," D. Mark Davis, Left Behind and Loving It, 2014. "I continue to wonder why Jesus is using parabolic speech and what followers of Jesus are supposed to do with them 2,000 years later." "Treasures," Nancy Rockwell, The Bite in the Apple, 2014. "The stories say: Shelter, Feed, cherish them as Prizes, pull them all in and sort it all out later." "Something Unexpected," Alan Brehm, The Waking Dreamer, 2014. "Despite all indications to the contrary, God's realm of justice and peace and freedom is here; it is real among us now. And Jesus' parables point to the promise that one day God's realm will define all of life in this world." In Romero the Parable of the Weeds can be seen in the opposition that Archbishop Romero encounters at the meetings of the bishops’ council. Ed McNulty, Visual Parables. "Hidden Treasure," Suzanne Guthrie, At the Edge of the Enclosure, 2014. "Using Both Old and New," Thomas Beam, 2014. "Today, using these guidelines, we thus preach both Law and Gospel to sinners and saints." "Treasure Hunting in the Kingdom," Bob Cornwall, Ponderings on a Faith Journey, 2014. "Are you ready to go the distance when it comes to the realm of God? I'm not completely sure that I am ready." "The Whole Story," Lynn Miller, Art & Faith Matters, celebrating our creative and living God by generating art and architecture resources for congregations and individuals. Art and Faith Matters facebook page contains additional resources. "Do You Really Get It?" Sharron R. Blezard, Stewardship of Life, 2014. "The kingdom of heaven is like you and me, ordinary sinner/saints, when the Spirit shines through us to part the clouds and mists of this beautiful, broken world." "The Greatest of All Shrubs," Kyle Childress, Ekklesia Project, 2014. "God's Way is quiet, small, slow, and humble, yet persistent and unrelenting." The Lectionary Lab, the Rev'ds Dr. John Fairless and Delmer Chilton (aka "Two Bubbas and a Bible"), 2014. Lectionary Lab Live podcast. "Parables of the Kingdom?" Christopher Burkett, Preacher Rhetorica, 2014. "If we are to hear the voice of Jesus in these parables, we have to hear them as disturbing and challenging, not reassuring and familiar. We have to hear them with the ears of the camel herder not the supermarket shopper." Evangelio Comentario del San Mateo 14:22-33 por Mercedes García Bachmann, Working Preacher, 2014. "Do You Understand?" Peter Lockhart, A Different Heresy, 2014. "...the kingdom of heaven is fundamentally about the reconciling work of God that occurs in and through Jesus." "The Kingdom of Heaven Is Like Yeast," Janet H. Hunt, Dancing with the Word, 2014. "Consider setting aside a little time on each day in the days to come to meditate on each of these marvelous every day images. Then think about 'writing your own parable.' How might you complete the sentence: 'Again, the kingdom of heaven is like...'?" "No Time Left for Waiting," Andrew King, A Poetic Kind of Place, 2014. Commentary, Matthew 13:31-33, 44-52, Preaching This Week, WorkingPreacher.org, 2011. "In the Treasure parable, one's "treasure" (thesaurus in Greek) is an important metaphor in Matthew indicating where one's allegiance ultimately lies and its nature." Mustard Seed Parable, audio telling, story in episodes, graphic, audio and written commentaries. Go Tell Communications, Biblical Storytelling for the Global Village, 2011. "Splashing Water on the Floor," Fr. Rick Morley, a garden path, 2011. "Jesus’ parables, the words of St. Paul, and much of the Bible should serve as a reminder that when it comes to the enormity of God, God’s Kingdom, God’s Salvation, etc. we are not only merely privy to dim reflection—silhouettes—but a silhouette is all we can handle." "Wow! Would you look at this?" Peter Woods, I am Listening, 2011. "How wonderful to realise as I look back on my life, that I really didn’t make much happen. When I tried too hard I tended to butcher it. No, I have been at my best, when I have simply allowed life to surprise me, and then responded to grace in gratitude and in giving." Holy Textures, Understanding the Bible in its own time and in ours, Matthew 13:31-33, 44-52, David Ewart, 2011. "Even those who are accustomed to finding and trading fine things might still encounter a life-changing experience. Even those involved in the church all their lives might still be transformed in ways beyond their imagining." Lectionary Blogging, July 24, 2011, John Petty, Progressive Involvement, 2011. "Could one say that Jesus encourages his disciples, the ones taught and trained by him in the way of the kingdom, to get rid of the old and the obsolete as well as ideas which Matthew might have considered "new-fangled"? Disciplined and trained, the disciples can be trusted to make this determination." "The Kingdom of Heaven Versus the Law of Diverse Things," Russell Rathbun, The Hardest Question, 2011. "What if what looks like disorder is voluptuous growth? " Commentary, Matthew 13:31-33, 44-52, Dale Allison, Preaching This Week, WorkingPreacher.org, 2008. "Strange Scripture," Alyce McKenzie, Edgy Exegesis, Patheos, 2011. "A rule of thumb of parable interpretation is this: identify what is strange about the parable. It is your window into the kingdom of God (or the kingdom of heaven as Matthew prefers to call it)." "First Thoughts on Year A Gospel Passages in the Lectionary," Pentecost 7, William Loader, Murdoch University, Uniting Church in Australia. "The good scribe or interpreter is one who both draws on tradition (scripture) and draws on contemporary experience as a parable of God's reality in the world, thus on both old and new." "Mustard Seed, Leaven, Priceless Pearl," Gospel Analysis, Sermons from Seattle, Pastor Edward F. Markquart, Grace Lutheran Church, Seattle, Washington. Detailed background and exegesis. "Underline the phrase, ?Have you understood this?? Jesus asked this question of his disciples and Jesus asks us this question also. Are we starting to ?get it?? Are we starting to grasp the reign of God for our lives and in our lives?" "As in the weeds and wheat parables and the shocking, unexpected, and unclean images in parables for this week -- we can't be certain about who is good or rotten, evil or righteous. There is a scholarship and understanding that is part of the kingdom and it requires both the new and the old; but there is also a scholarship and understanding that is not part of the kingdom -- either emphasizing only the old or only the new or looking in the wrong treasure box." "Violent Parables and the Nonviolent Jesus," study guide, Robert B. Kruschwitz, (other resources at) "Parables," Christian Reflection, The Center for Christian Ethics at Baylor University, 2006. "The Mustard Seed," Mark Vitalis Hoffman, Lutheran Theological Seminary at Gettysburg, CrossMarks Christian Resources. The Parables of Jesus - to learn & teach, to share & discuss, to re-imagine & re-present. "While there are a multitude of creative images for experiencing the presence of GOD, the best parable has always been the life of a human being who is able to listen to GOD and live with Neighbors." "Risk and Reward," Larry Broding's Word-Sunday.Com: A Catholic Resource for This Sunday's Gospel. Adult Study, Children's Story, Family Activity, Support Materials. "What is the greatest reward the world can offer you? What are you willing to sacrifice so you can own it?" "The Mustard Seed and the Yeast," "Parables of the Kingdom," Rev. Bryan Findlayson, Lectionary Bible Studies and Sermons, Pumpkin Cottage Ministry Resources. Includes detailed textual notes. Wellspring of the Gospel, Ordinary 17A, Catherine McElhinney and Kathryn Turner, Weekly Wellsprings. "Parables of Jesus," "Mustard Seed," "Yeast," "Hidden Treasure," "Pearl," "Net," wikipedia. "Matthew's Nonviolent Jesus and Violent Parables," Barbara E. Reid, O.P., (other resources at) "Parables," Christian Reflection, The Center for Christian Ethics at Baylor University, 2006. "Jesus' Sermon on the Mount instructs us to not return violence for violence; instead we should be like God, who offers boundless, gratuitous love to all. But in the same Gospel Jesus tells eight parables in which God deals violently with evildoers. Which of the divine ways are we to imitate?" Synopsis (English) and discussion by Dr. Mahlon H. Smith, Rutgers University. Focus is on literary relationships of texts. Includes non-canonical parallels and discussion of textual origins. "This parable asserts the authority of an ancient scribe to alter a text by interpolating new material that was not found in the text he was copying." "Then Jesus is reported to supply his disciples with an interpretation, in spite of his insistence a few lines earlier that they already knew 'the secrets of the kingdom' and, therefore, needed no explanation." "Guidelines for Interpreting Jesus' Parables"
"The Parable of the Mustard Seed"
Bloom, Metropolitan Anthony, "The Life of Prayer," Theology Today, 2004. Gaventa, Beverly R., "Both the New and the Old," The Christian Century, 1993. Issler, Klaus Dieter, Delmar, "Five key barriers to deep learning and character formation based primaarily on Jesus' parable of the four soils," Christian Education Journal, 2012. Jacobson, Delmar, "An Exposition of Matthew 13:44-52," Interpretation, 1975. McIver, Robert K., "The Parable of the Weeds among the Wheat (Matt 13:24-30, 36-34) and the Relationship between the Kingdom and the Church as Portrayed in the Gospel of Matthew," Journal of Biblical Literature, 1995. Phillips, Peter, "Casting out the Treasure: a New Reading of Matthew 13.52," Journal for the Study of the New Testament, 2008. Toussaint, Stanley D. and Jay A Quine, "No, Not Yet: The Contingency of God's Promised Kingdom," Bibliotheca Sacra, 2007. Wilmshurst, S.M.B., "The Historic Present in Matthew's Gospel: A Survey and Analysis Focused on Matthew 13.44," Journal for the Study of the New Testament, 2003. "A Promise for Preachers," Pastor Kurt Lammi, Day 1, 2014. "What Is Priceless?" Marilyn Saure Breckenridge, SermonStudio. "Go for the Gold," Bishop William H. Willimon, Day 1, 2005. "Who's Who?" Dr. Angela Bauer, Episcopal Divinity School, 2004. "The Mustard Seed," "Treasures and Pearls," Pastor Edward F. Markquart, Sermons from Seattle. "Looking for the Kingdom of God Too High Up and Too Far Away," the Rev. Dr. William L. Dols, Day 1, 2002. "Nonchalant in the Real Estate Office," the Rev. Dr. Norman Pott, Day 1, 1996. The Mustard Seed, Elaine M. Ward, SermonStudio. "X Marks the Spot," Charles Kirkpatrick, Sermons4kids.com. "Jesus Tells Us about Heaven," Sunday School Lessons: Family Bible Study, art projects, music, stories, etc. "Parable of the Treasure and the Pearl," children's study, puzzles, coloring sheet, etc. Higher Praise Christian Center. "The Treasure," Kevin Penner, dramatix. "X Marks the Spot," John Fewings, dramatix. Clip Art Images: Matthew 13:44-52, Misioneros Del Sagrado Corazón en el Perú. 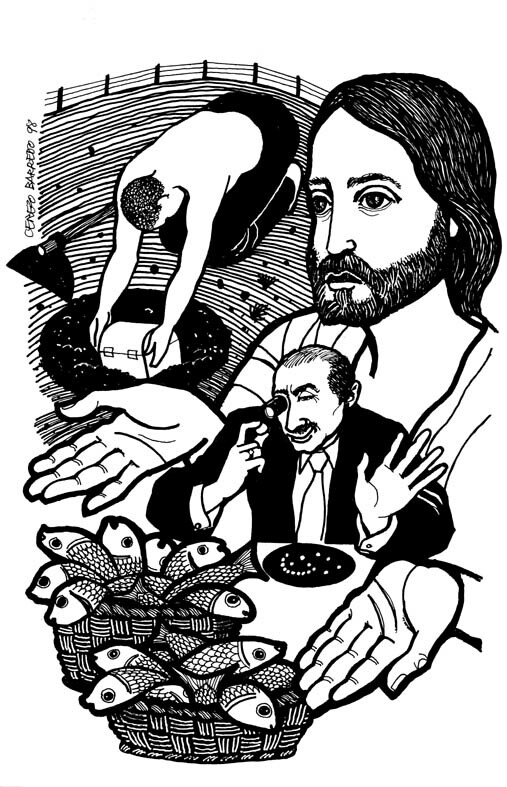 Matthew 13:44-52, at Cerezo Barredo's weekly gospel illustration. Liberation emphasis. Treasure in the Field PowerPoint Slide Masters. Henry Martin, sermons4kids.com. “To What Can the Kingdom of God Be Compared,” an original hymn by Carolyn Winfrey Gillette, 2011. This hymn celebrates Jesus’ three short parables about the reign of God (Matthew 13:31-52). Tune: TO GOD BE THE GLORY 11.11.11.11 with Refrain (“To God Be the Glory”). Hymns with Scripture Allusions: Matthew 13:31, 38, 39, 40, 44, 46, 49. The Cyber Hymnal. "Long Have I Suffered," Brenton Prigge, NewHymn. In the movie "A Simple Plan," a treasure is found in a field, and a man sells everything he has to obtain it. Turns out that what he sells is what has been his true treasure all along.